Each hoop measures approximately 7/8″ in diameter. The band is graduated in width size, measuring almost 3/8″ wide at its widest point. These sterling Taxco Mexico 925 silver earrings are aptly named after the quaint cobblestone streets that meander through the hillsides of Taxco! 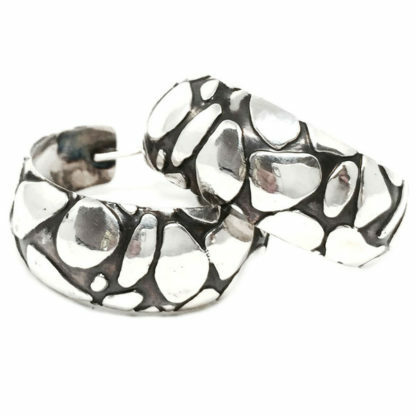 These sleek and modernist hoop earrings contain a partially oxidized silver finish, completing the texture of this set.